$50 - $65 Flower Centerpieces At every imaginable price range and in a superb selection of flowers, we have that ideal centerpiece you are after. What a better way to surprise a special friend then by sending them a birthday flower centerpiece . 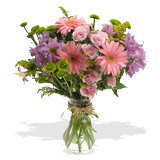 This centerpiece could contain flowers of their birth month, or it could be an arrangement of their favorite colors. And if you have a friend or relative with a baby shower coming up, then surprise them with one of our stylish baby shower flower centerpiece.